So, it's Monday. 'Nuff said. Let's talk about Sunday instead. Our goal was to go to my friend Cindy's house and fix her wall. When her husband died suddenly in April (wow, time is really rolling around) he had been in the process of fixing leaking bathroom pipes. 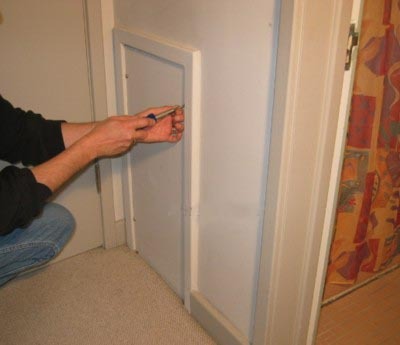 There wasn't any access panel, so he had ripped apart some of the wallboard in the hallway to be able to replace the leaking pipes, leaving a gloriously ugly hole in the wall of the hallway when he died. Cindy had asked us if we could repair this and it was well within our skills, so DH took measurements and we left it until I was back from Milwaukee. This isn't exactly what we did, but pretty close. It looks GOOD! We put together a luan panel with a nice frame around it, and packed the car with tools, a workbench, more tools, the panel and frame, and more tools. Off we went to save the day. We arrived shortly after Noon and started work. We roughed the wall to the dimensions we needed, added spacers for depth on the panel, mounted the framing to the panel, primed it a lovely white color (they will have to paint the hallway anyway, so now it's ready to be painted) and mounted it to the hole in the wall. Voila! No more hole in the wall! We also began patching some holes in the walls and some corners that had seen better times. We'll have to go back and work on those a couple more times as they are too deep to do in a single time. It was very successful, though. 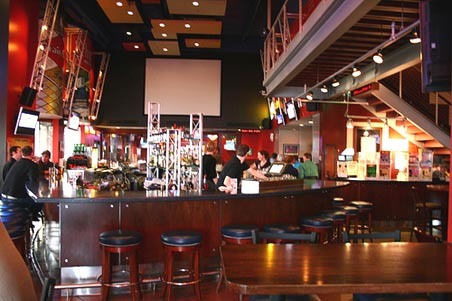 Grumpy's Bar and Grill features a large, vaulted bar and more cozy eating areas. We're bar people, so we sit in this room. When we got home and unpacked the car, we decided a beer was needed and went down the street to Grumpy's. Normally we would have walked there, but DH couldn't make up his mind about where to do until we were already driving. After he had two beers and I had two Guinness and we each had a fabulous burger with fries we were feeling more human and returned home to watch the second Sherlock Holmes movie (loved it). I finally relaxed with a strawberry lemonade and finished my beta for Lai. Chapter 24 is back at her for another look-over and more changes. All in all - a successful Sunday! Current Location: Running late at 6 am! Sheesh! She is a dear friend, one who I am not in contact with as much as I should be. My bad. But she knows that we always are there whenever she needs us and has called on us various times over the years. I know she's still hurting over Rich's death - big time. It's been very hard for her so we were happy to be of any help at all. That was so nice of your DH and you. I love to hear people helping out! The bar is huge. DH is all upset today because yesterday's indulgences caused him to put on four pounds (which will be gone tomorrow I'm sure). For a change, I didn't gain anything off my Guinness and food. Quite unusual and I was very grateful. Now I'm hungry! It sounds like you both earned it. Good for you. I eat beef very rarely and this was a real treat. I bet your friend is very glad to have that taken care of. Your Grumpy's excursion was well-earned. I love the name of the bar too, especially because we're always joking about how grumpy my DH is. If you were closer, I would totally try to bribe you with knitted things to help me fix up a few things around my parents' house. :D I'm afraid I have no skill with any kind of carpentry. I haven't seen the second Sherlock film yet. Glad to hear it was a good one. If you were closer I would be delighted to work out some trades for knitted things. I love working with wood and carpentry, although DH is better at many aspects of it. I think he needs to have something of his own, so I let him play and I keep my own woodworking to a smaller scale - my jewelry boxes and such. I enjoyed the 2nd Sherlock film, but I love Robert Downey Jr in the role and Jude Law plays beautifully off him. Mycroft is a hoot and Moriarty is much more up front than I would have thought for a master criminal. Delightful.